Although millions of people in the United States love to ride bicycles for exercise or leisure, statistics show that only 1% of the total U.S. population ride bicycles for transportation—and barely half as many use bikes to commute to work. 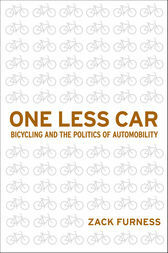 In his original and exciting book, One Less Car, Zack Furness examines what it means historically, culturally, socioeconomically, and politically to be a bicycle transportation advocate/activist. Presenting an underground subculture of bike enthusiasts who aggressively resist car culture, Furness maps out the cultural trajectories between mobility, technology, urban space and everyday life. He connects bicycling to radical politics, public demonstrations, alternative media production (e.g., ‘zines), as well as to the development of community programs throughout the world. One Less Car also positions the bicycle as an object with which to analyze and critique some of the dominant cultural and political formations in the U.S.—and even breaks down barriers of race, class and gender privilege that are interconnected to mobility. For Furness, bicycles not only liberate people from technology, they also support social and environmental justice. So, he asks, Why aren’t more Americans adopting them for their transportation needs? Zack Furness is an Assistant Professor of Cultural Studies at Columbia College Chicago and a member of the Bad Subjects collective.